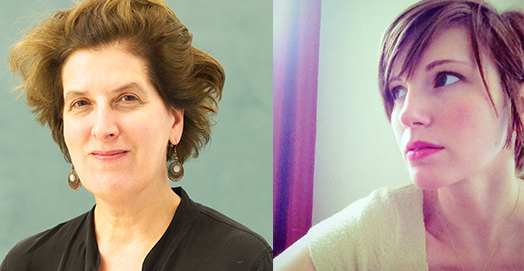 Translators Margaret Carson (left) and Heather Cleary (right). On a recent sunny but blustery winter day in New York City, I sat down with Margaret B. Carson and Heather Cleary, both translators into English of the Argentine writer Sergio Chejfec. In the last three years Carson and Cleary have, separately, translated three novels by Chejfec, whose work, which also extends to essays, poetry, and short stories, has been translated into several languages. While living in Caracas from 1990 to 2005, Chejfec was editor of Nueva Sociedad, a journal focused on social sciences, politics, and culture. A former fellow of the Guggenheim Foundation and the Civitella Ranieri Foundation, he currently resides in New York City, where he teaches in the Spanish MFA program at NYU. Carson translated the first Chejfec novel to make it into English, My Two Worlds (Open Letter, 2011). Her translation made the longlist for both the 2012 Best Translated Book Award and the 2013 International IMPAC Dublin Literary Award. In addition to My Two Worlds, she's also translated essays by Chejfec, and is finishing the translation of Baroni: A Journey, the novel that immediately preceded My Two Worlds. Heather Cleary's translations and literary criticism have appeared in Two Lines, The Quarterly Conversation, and Words Without Borders. She was awarded a PEN Translation Fund grant in 2005 for her work on the poetry of Oliverio Girondo, and her recent publications include two novels by Sergio Chejfec—The Planets (Open Letter, 2012; finalist, Best Translated Book Award) and The Dark (Open Letter, 2013)—and Poems to Read on a Streetcar, a pamphlet of Girondo's poetry (New Directions, 2014). She is a founding editor of the digital, bilingual Buenos Aires Review and is wrapping up a Ph.D. at Columbia University. During our conversation, the questions that occupied Carson, Cleary, and me rotated around the usefulness of drawing relationships between a foreign writer's work and that of English-language writers, the translator's relationship with the writer, and helping readers of translations place a writer within a national literary tradition. By the end of our conversation, Carson and Cleary had begun a friendly discussion of the most difficult of Chejfecian words to translate, and the tricky question of "natural" language. Can you each talk a bit about how you came to translate Chejfec? Carson: I met Sergio through a mutual friend, the poet Mercedes Roffé. I think we met shortly after he arrived in New York from Venezuela and then we started talking about translation. But it took a couple of years before the My Two Worlds translation project began. So you were familiar with his work before? Carson: Well, he sent me some books. And no, I didn't know his work. I was a little bit surprised that I hadn't heard of him. Did he propose that you do the translation? Carson: No, I had been doing some translations for BOMB Magazine and at that point they had a yearly Americas issue. I'd established a relationship there and could pitch pieces to them, so I did. As it turned out, the upcoming issue was going to be focused on Montevideo, Buenos Aires, and Santiago de Chile. Sergio had sent me a manuscript he was about to publish in Argentina and I thought an excerpt from that would be a better way to go. In My Two Worlds, there's a lot of discourse about walking, which is sort of in the air right now. So I thought, hey, this might be something that BOMB might pick up on. It seems like another one of these "celebration of the walk" novels, but Sergio's not celebrating the walk at all. That's how it started. But there was one problem: because the novel is set in Brazil, it didn't fit into the theme of that issue. I mentioned that to Sergio and he wrote two or three additional paragraphs that linked the excerpt to Buenos Aires. Cleary: Sort of similarly, I met Sergio through a friend. He was publishing a chapter in a volume of literary criticism and needed a translator for it. That's how we first got in touch. When I was done translating the essay, we began talking about the novels and he sent me The Planets and Boca de lobo, which became The Dark. I've been working with Sergio for about eight years now. That raises an interesting question, because you both say you weren't really aware of Chejfec before you were introduced to him: What space does he inhabit in Argentine literature? It's obviously even more interesting, too, because he's a writer who hasn't just lived in Buenos Aires—he spent some time in Venezuela and now New York. Cleary: He's a prominent figure in Argentina, though he's known primarily as a writer's writer. I don't think his texts are really for the faint of heart, either in Spanish or in English, but he does have a large following. And I've noticed that's beginning to happen here in the States, too. A specific sort of reader has found his work. This has been happening for years in Spanish, but it's encouraging to see it now in English. Carson: And he's been published in Germany, too. I know that My Two Worlds has been translated into French. One thing that interested me was the order in which the translations were published—they didn't appear chronologically. Carson: Well, that's interesting, and I want to ask you, what are your assumptions about how books are published in translation—would that seem like an anomaly? Not necessarily. I'm thinking of certain contemporary Brazilian writers and the first books of theirs that come into translation are, in reality, the second or third novel they've published. So, I'm not sure if this is because they've gained a certain cachet by that point. Carson: There's a lot that goes into selecting books for translation, but the case of Chejfec might be different because he was sort of unknown. He wasn't being represented by an agent, there wasn't a publisher that had been working with him, and then BOMB Magazine, I knew that they would publish something. I wouldn't exactly call it serendipitous, but it certainly wasn't a carefully planned path. Translation is different—it's something that has to be worked in when you're reading an author in translation, that you might be receiving things in reverse order. Cleary: I think for me, working with two novels, the consideration was more which one would set the stage for the other in an effective way. The decision was that The Planets was better at laying the groundwork for the reader and that The Dark was a more complex case because of its unsympathetic narrator, though that's also what makes it so interesting. Anyway, we thought it would be better to start with The Planets. I think it's interesting to think about it in the sense of accurately representing a literary career and scene, and whether it makes a difference if the presentation isn't chronological. Cleary: Which is sometimes misleading. I think one of the interesting things about translation is that it denaturalizes some of those connections and shows the way literary circuits can be less linear than they appear to be if you're studying a single national tradition. Carson: I think it enriches the reading. It makes it more complicated in a way that's good. Cleary: It also seems to me that if you have a reader who's really interested in Chejfec, this person is going to go and look up the dates the books were originally published if they really want to track the evolution of certain ideas or a certain style. Someone who's already that interested will go back and trace those lines. It's just a matter of finding a point of entry when it comes to choosing which book to publish first. So in that way, it seems that maybe it causes anyone who's paying attention to become more curious, to be obliged to delve more deeply into a certain literary tradition in a way they might not have otherwise. Carson: Yes, to be less of a passive reader. Reading in reverse—I mean, we've done it in English, right? We start with Austen, maybe we pick up the last novel and then go back to the beginning. I think what may be happening with Chejfec is that because he's contemporary, there's a sort of assumption that the novels are coming out in order, and that the next novel in translation should be an outgrowth of the novel before it. That's another myth we should try to challenge about how translations are published. It would be very interesting to find other authors, [W.G.] Sebald, for example, who was introduced by one book and there was interest and then other books followed without regard for publication history. Argentine writer César Aira is perhaps the best example: there are so many books that are coming out, but they're coming out without respect to their original publication order. Cleary: In a certain sense, I think deciding which novel will be translated next has to do more with its reception, and probably the personal taste of the publisher, more than any chronological criterion. At the end of the day, it's a business and the case that will be made for the book is the reception it's had in the original language, and what's happened with any existing translations. But there are exceptions, of course. I want to talk a little bit about characterizing Chejfec. In his review of My Two Worlds, Scott Esposito writes, "Curiosity about the mundane, of course, is a common enough quality in a writer. What distinguishes Sebald and Chejfec is how thoroughly they wed mundanities with defamiliarization." What do you think about the comparison with Sebald and how do you define Chejfec's work? Cleary: I don't think Chejfec is a writer who is easy to encapsulate. I do see what Scott is saying about the uncanny in Chejfec's work, this process of scrutinizing something familiar so closely that it all of a sudden becomes unfamiliar and the object of a deeper reflection. I think that's key. Another thing that really strikes me about Chejfec is that he has this brilliant, sharp sense of humor, which is something most people don't discuss. But I think his philosophical ruminations are nicely offset by this quality. Carson: When you translate an author, you immediately start questioning the way that publishers, critics, and readers frame that author. Going back to what I said before, there's a lot of criticism in My Two Worlds, implicit and explicit, of the long walk as a sort of therapy, which is something I don't think any critic has picked up on yet. It's basically been reviewed as another entry in this "walking genre"—and it is, but it's a sort of anti-walk novel, and that would be a very interesting review. It's fairly common to draw these sorts of comparisons, to find somebody in the English-language tradition and say, "This writer is sort of in the vein of this person." Is that helpful or can it be more harmful? Cleary: It's good for the elevator pitch, and in a certain way it gives you a framework, but you have to be willing to let it go. Still, I don't think having someone who might not have read Chejfec pick up one of his novels because of a pre-existing interest in Sebald is a bad thing. In the end, they'll either agree or disagree about the connection, but I don't see it as such a bad way of entering the work. Let's get back to the translating itself. You both have been very fortunate in that you live in the same city as your writers, which isn't the case for most translators. What kind of collaboration do you have with Chejfec? Carson: It was important to know Sergio personally and get a sense that he was invested in the project. He's fascinated by what the translator is doing—it resembles, particularly in its uncertainties and ambiguities, the thought process of his narrator. I found Sergio to be very patient and generous with his time. At some point I was weighing, "Should I ask him this?" and I decided "I'm going to ask it because I really want to know and the translation will reflect the quality of this relationship." He speaks of translation as a transmigration, which is another noteworthy point. Sergio's not a translator himself but he respects translation, you don't have to win him over. Translation seems like just another facet of his literary practice that he'd fold this into the novel in Spanish, expand it with this new chapter of translation. Cleary: I've described working with him exactly that way—he's incredibly generous. It's always surprised me, the care with which he responds to questions. Getting to know him was also important to me because it became clear that his narrative voice, which seems so literary and so analytic, is actually very much the way he talks. And that came to inform the way I translated him. The questions we actually deal with over email, which I think gives us both time to reflect on how we want to phrase things. Because ultimately that's what we're getting at, those really specific points, which at least I have a hard time getting right over coffee. Carson: The answer to my questions as a translator would often come back from Sergio as, "I don't know what that means." So how do you deal with that? But it's part of the translation to reflect the meaninglessness. And I don't know about you, but I also think that when I'm so closely going over each sentence I'm questioning everything. When you step back just a little bit you realize it doesn't have to resolve quite as clearly as you want it to. The grey area is good. Cleary: And that's one of the hardest things to preserve in translation. What else is difficult about translating Chejfec? Carson: Bueno, that, too. He has this very strange word, compenetración, and I thought, "I don't want to use this word in English," but I did because it's part of his lexicon. Cleary: In The Dark he uses two terms—landscape and geography—frequently, and I remember there was this one passage where I said, "this would make more sense and sound better if we switched these two words, just this once." But even though the words appear to be used interchangeably in the narrative, that's not the way he sees it. Carson: I think translators have to step forward in introductions and afterwords, because we need to speak about some of these issues—how to pull back this curtain and say this was not written in English, these are some of the issues that came up, and the translator is present in this translation because of these choices. It's really good when translators have this space and can do that sort of narrative because it's something that you want the reader to know. Heather, you wrote on your blog about Chejfec: "I'm always struck by the way his prose both deflects and draws the reader in, never allowing complete immersion in the narrative: whether explicitly or implicitly, the medium in which the story is told is under constant scrutiny. In other words, I'm struck by the way Chejfec's language is never 'natural.'" I'd be curious to hear how this finds its way into the translation process. Cleary: What I was referring to specifically was the sort of philosophical reflections you see in his writing, his self-conscious use of language and his exploration of the limits of narration. This aspect of it isn't particularly difficult to translate, because it's an explicit part of the text. On another level, I was talking about his use of language in a strictly non-colloquial way. I was drawing from an interesting essay called "Simple Language, Name"—which Margaret is translating now—in which he describes his evolving relationship to Spanish. He's also talked about how he tries to use this sort of hyper-neutral but also particular language in which the terms are familiar but they're used in a way that may seem slightly off. And that's the more challenging part from a translational perspective, to find what correlates to that uncanniness in English—where the usage is intelligible, but just a bit uncomfortable. Eric M. B. Becker is a writer, translator, and award-winning journalist. He received a 2014 PEN/Heim Translation Fund Grant for his translation of a short story collection by Mozambican writer and 2014 Neustadt winner Mia Couto. He has recently published translations of Brazilian writers Edival Lourenço, Eric Nepomuceno, and Carlos Drummond de Andrade in The Massachusetts Review, MobyLives, and Asymptote. In 2014, he was recipient of a Louis Armstrong House Museum Residency.